This is a blank Affidavit of Heirship sample form. You can use it along with your personal information to create your own Affidavit of Heirship. 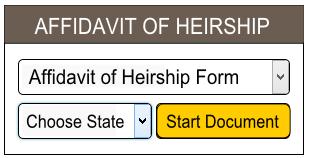 Using an Affidavit of Heirship, you can identify the heirs of the estate. First, the Heirship Affidavit gives notice that a person has died intestate, or without a will. And then, the Affidavit of Heirship establishes title to the property. Affidavit of HeirshipThis Affidavit of Heirship must be filed in the County Clerk’s recordThis Affidavit of Heirship must be completed by a third disinterested party (Affiant) who will not benefit from the decedent’s estate. Do not complete this form if the decedent left a will that was probated in court or there has been some other type of court determination to the estate. 1. My name is: _______________________________________________________. I am personally familiar with the family and marital history of: ______________________________________________ (Decedent), and I have personal knowledge of the facts stated in this Affidavit. 2. I knew the decedent from ________________ until ________________ Decedent died on ______________________ . Signed this ____ day of ____________________, ____________. My commission expires: _____ day of __________________, _______. THIS AFFIDAVIT MUST BE FILED IN THE COUNTY CLERK’S RECORD. Fill out and print a free Affidavit of Heirship form in just five minutes online.